Carol Thompson, Peter Jezierski, Jim Romanowski. Meeting point was Glenbrook Station at 8:30am. 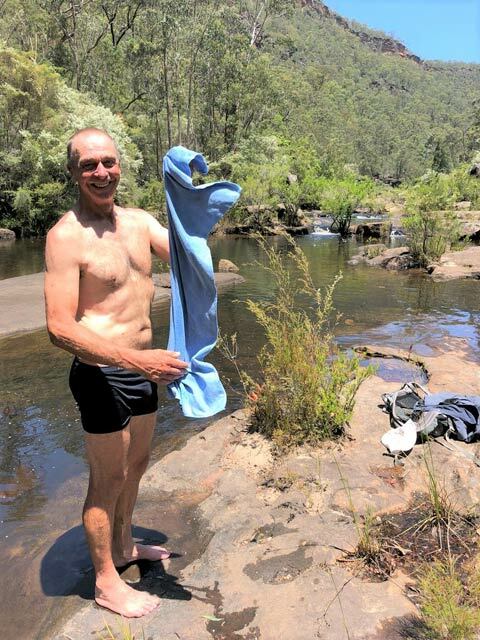 After introductions Bob outlined the walk and discussed the potential hazards - walking off track, snakes, exposure, creek crossings, scrambling and especially hydration (the temperature forecast was for 33C & it did reach 35C). 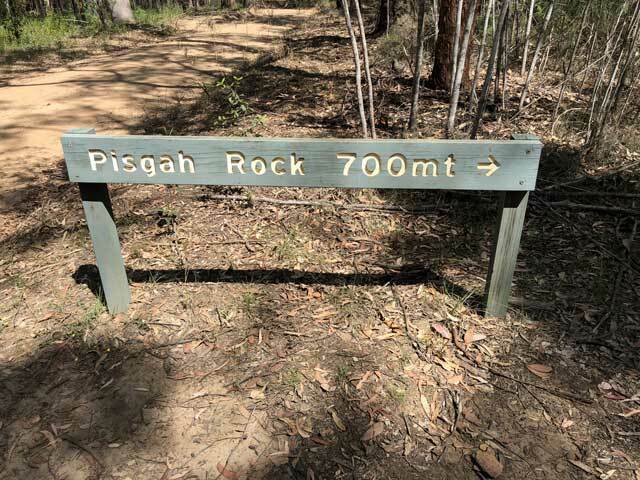 After an 11 km drive to Pisgah Rock car park we followed the Pisgah Rock Walking Track for about 150m before turning right to connect to and follow the Monkey Ropes Creek Trail to Lincoln creek. This steady descent involved walking in and along the dry creek. The canopy provided shade from the rising temperature. A towering Blue Gum was a surprising highlight. On reaching Lincoln Creek the walk involved some easy rock hopping along a fairly flat rock platform. The sight & sound of the running water here generated a pleasant, relaxing & soothing atmosphere. 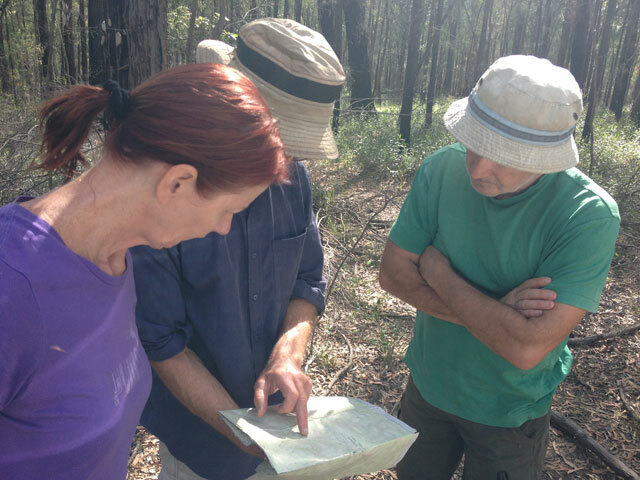 We passed a well-established campsite area set among some lovely eucalypts. We continued to the junction of Lincoln Creek and Erskine Creek. From here the path was up Erskine creek. With the water level higher than normal we searched for a suitable spot to cross. This was a challenge as the track faded and the going became slow with bush bashing, scrambling & rock/boulder hopping required. 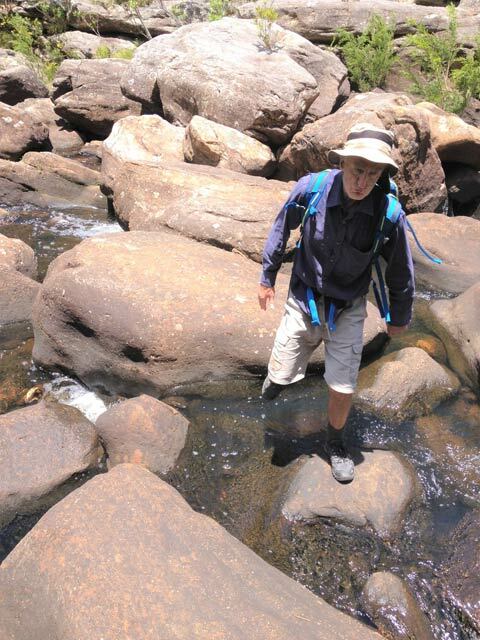 Eventually we found a “dry feet” crossing unlike two other groups who crossed with shoes off. A well-earned morning tea followed. With the creek now on our right the walking was on a vague trail but it was considerably easier than what we had endured prior to the creek crossing. After passing a few overhangs we arrived at Dadder Cave. 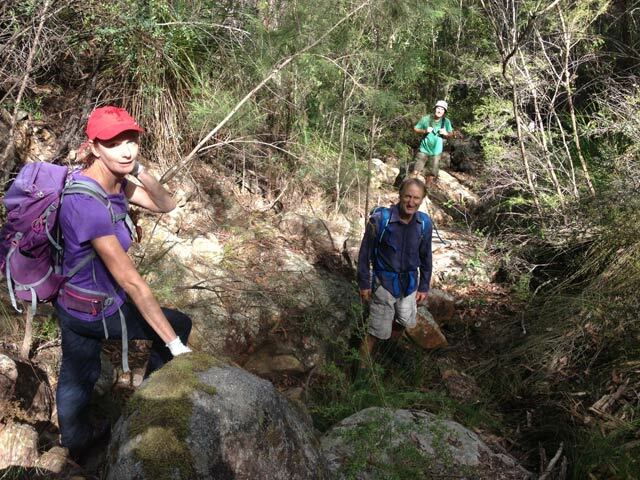 History has it that this camping cave has been used by bushwalkers for decades. This sandstone cave provided protection from the soaring temperature. The cave included a fire place, a bench seat, a variety of unopened can food, toilet paper and a log book that made interesting reading. It is believed the cave was named “Dadder” after a Death Adder that lived here (not seen today - Amen). Venturing further up the creek we reached Blands Pool, a large, wonderful water hole which we had to ourselves. It was time for lunch and a refreshing swim. Returning to the junction of Lincoln Creek and Erskine Creek with the temperature in the mid-30s we all had our second swim of the day. Yes, 2 swims on a day walk! Refreshed we took the challenging ascent (195m) up & up to Pisgah Rock. 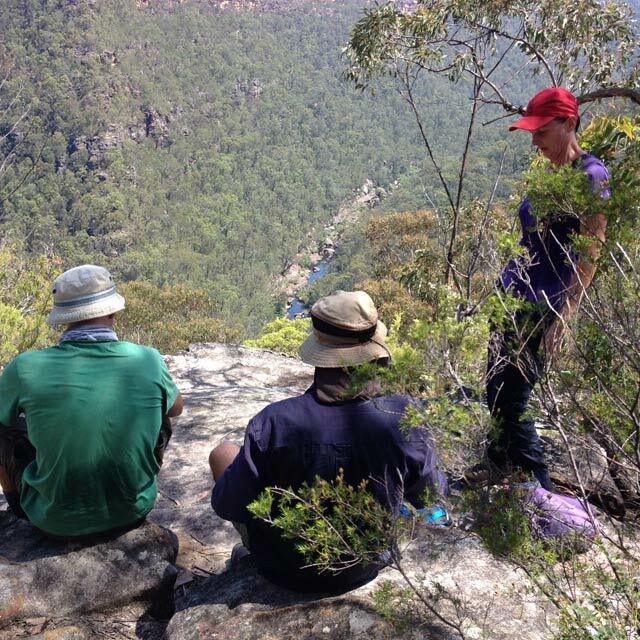 You need to exercise caution here as the climb involves narrow ledges along the cliff line with short sections of difficult scrambling & exposure. At Pisgah Rock we had a much needed drink & enjoyed the outstanding views. With only a short walk back to the car park Bob convinced us to add 2 side trips. One to Attic Cave where there is copy of “the Good News Bible”. 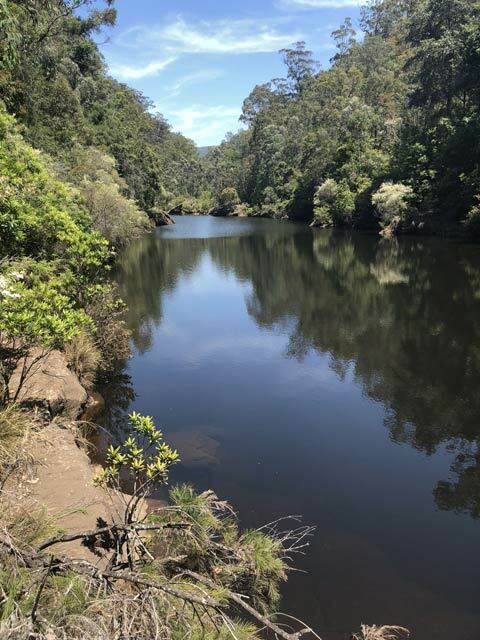 The second to the Nepean Lookout with stunning views over the Nepean River. 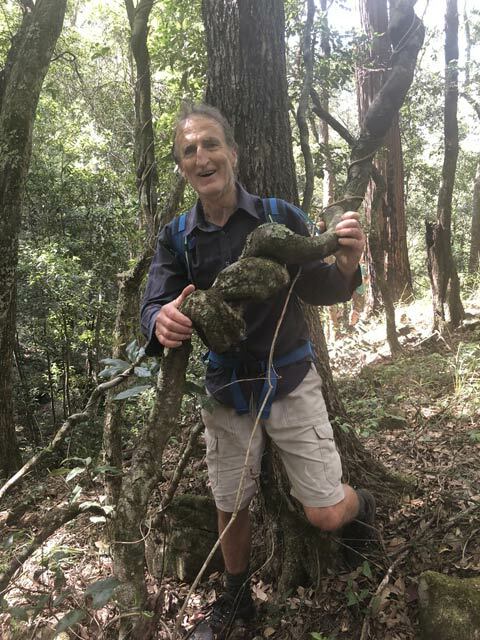 The Walk Highlights: Our two swims, The ascent up to Pisgah Rock & Dadder Cave, but more so the camaraderie of a small, fit, supportive group well led by Bob in somewhat oppressive conditions. Distance 10 Km, Total Ascent 422m, Walking time 6:32hrs.